The history of the Clynelish distillery is a little bit confusing. It was founded in 1819, and cheerfully produced its whisky until the 1960s, when another distillery was built right next to it. This new distillery was also called Clynelish. The first distilleries name was changed to Brora, and its style was changed too (they started using heavily peated malt). The "new" Clynelish continued to produce whisky as Clynelish from then on, with Brora eventually closing in the 1980s, and now some of the Brora distillery is used as a visitor centre and warehouse for Clynelish. Yeah, you might need to read that twice to get fully up to speed. 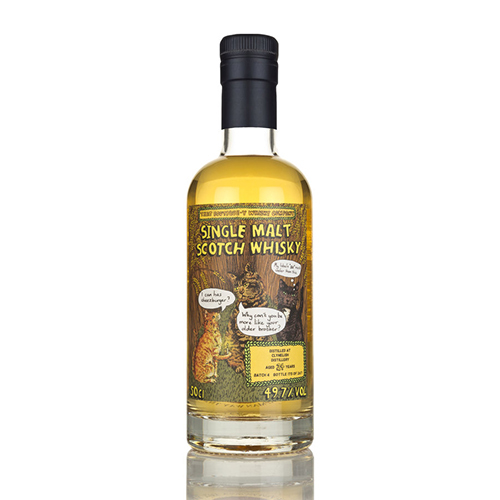 Our Clynelish label features cats that can talk like them cats from the internet pictures of cats that can’t spell. Have you heard about the internet? It is good.